A 6-digit Registration User Number (RUN) is required for many students in order to perform self-registration within SalukiNet. The University's use of RUNs helps to ensure that there is regular contact between the student and their academic advisor in order to appropriately plan the student's course of study as they work toward a degree. The RUN is unique to each student and will be different from term to term. (At the very least, a RUN for a Spring term will start with a 2, a RUN for a Summer term will start with a 4, and a RUN for a Fall term will start with a 6; but, for security purposes, the differences should extend beyond the first digit as well.) Students who are required to have a RUN should get the RUN from their academic advisor, typically at the time of advisement for the upcoming advance registration term(s). Who is required to have a RUN Number? Only some graduate departments require the use of RUNs for their Masters and/or Doctoral students. Graduate students should check with their departments to see what is required. Finally, MEDPREP students are required to have RUNs, but Law students (JD) are not. What if I have problems with the system accepting my RUN? The first point of contact about RUN problems should be your advisor or advisement unit. They are the ones who know what your RUN for the term should be. Please note that the I.T. "SalukiTech" Help Desk (Computer Support Center) is not able to assist students with RUNs (though they can assist students with SalukiNet login and password issues). If the RUN you enter is not acceptable to the system, you will first get a message that says, "Authorization Failure – The RUN you entered is not correct for this term. Please enter the correct RUN below." This means that the RUN that you entered is not correct for the term that you have selected to register for. The registration term is important here, and on that RUN entry screen you can look at the right side of the screen to see what term you have (explicitly or implicitly) selected. Make sure that it's the term that you want to register for right now. If not, return to the Registration menu (example here) and click on the Select Term link to explicitly choose the correct term before going back into the Add or Drop Classes link. If you have the correct term and you enter a RUN that is still not accepted by the system, eventually you'll get a message that says, "Authorization Failure – The RUN you entered is not correct for this term. Please contact your advisor to get the correct RUN for this term, then return to the Student menu and start again." Again, you should contact your advisor or advisement unit to get your RUN again, since it sounds like you may have been given an incorrect RUN for the term. Once you've gotten your RUN, please return to the Registration menu and then try again. If you get a different error message than the above two when attempting to enter your RUN, then please contact our office (using contact information near the top of this page) and be ready to tell us what the error message says exactly. (We don't know every possible error message in the system, so we may have to research what your particular message means.) But for the most part, RUN issues boil down to an incorrect RUN being entered or an incorrect term being selected. 1 Effective with RUNs for the Spring 2017 semester or later, undergraduate students as noted above will still be assigned a RUN, and they will still need to use it in order to register for the first time for that term. Once successfully registered, within a day or two after that, most undergraduate students should then no longer be prompted to enter a RUN on future days when trying to make further registration changes for that term. 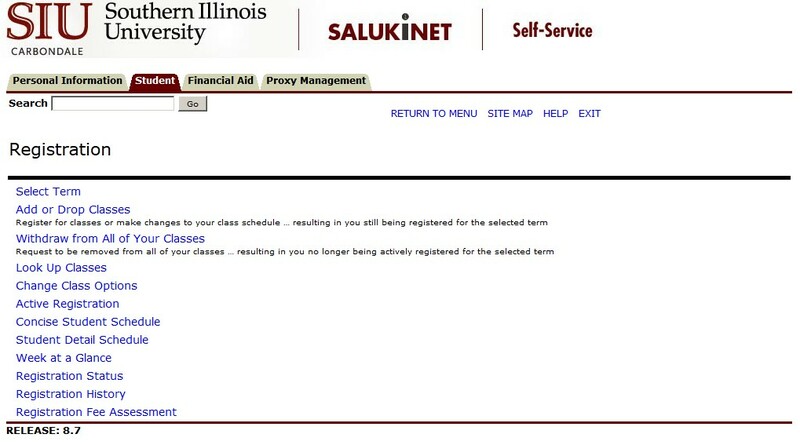 This change does not impact graduate students, so they will still be prompted to enter a RUN in every SalukiNet Self-Service session if they are assigned a RUN.